But one of the best presents I got was to reflect on "The Present". Last October 1st, the fabulous Stacy Julian wrote a blog post that challenged scrapbookers to 1) capture a little slice of their "Present", 2) to carry that little album with them for a year and 3) to document the experience one year later. 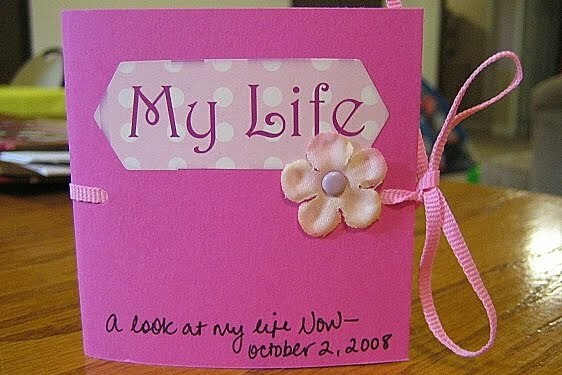 I liked the way it coincided with my birthday and the idea of giving yourself a present, so I made up this little album. I pulled all the pics that focused on the important people I had in my album and wrote about what had happened in our lives over the past year. It was so neat to see the differences in the boys and even in myself. I thought about what we all had accomplished, the challenges we had faced and where we are right now. And the cool part is that I think I have crafted a new tradition for my birthdays...from now on it will be a time to reflect not only on my age, but on the experiences I have had in the previous year and the ones I want to have in the coming year. From now on, The Present will be my own birthday present to myself. Lots of scrapbookers took part in this project and if you would like to see their layouts check out this Flickr Gallery. Thanks Stacy for providing continuous inspiration! Happy Belated! I love your new profile pic! Hope you're feeling better.